With a little knowledge, people can be fruitful, limited, dangerous, or irrelevant. What if someone has great skill but low character, or great character but little skill? As Christians, growing in Christian maturity means the church equips believers for the work of ministry, for building up the body of Christ. This involves developing both character and skill. Consider Ephesians 4:11-16 and Psalm 78:72. 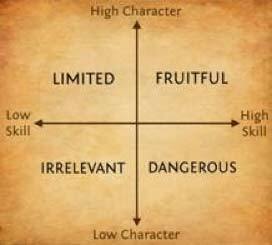 There are different implications if one has high or low character and high or low skills as a Christian. Scripture is clear about the need for Christians growing from spiritual infants to mature adults. Equipping should address the whole person—head, heart, and hands. What results if we are not addressing character along with knowledge and skills? As you ask God if you are called to go or what your role is in ministering to others, keep the above image and Scriptures in mind. God desires for us to be fruitful. • What do believers need to know? • Who do they need to be in Christ? • And what will they do as a result with the skills needed? God desires to transform our character to be like His and to equip the body for the work of ministry and making His name known among the nations. Are there areas you or your missionaries and ministers need to develop for cross-cultural missions? Contact Church Equipping to discuss whether we can help your church develop cross-cultural competencies while also addressing the heart of a missionary.